My daughter Camryn will turn 13 in a month. She was halfway through her childhood at 9. Now she is just 5 short years away from legal adulthood. I'm not sure we're ready for this. I remember at the younger ages from about four to seven or so.....this push and pull thing going on. Like, I'm getting big, but still little enough to need my mommy a lot. This age involves a lot of push and pull too. It's always about a month before Camryn's birthday that I start noticing changes in her. It's like her biological clock is perfectly timed to her birth date. She will suddenly acquire a new skill or a fresh new understanding of something. She will gain a new perspective or form a new opinion. Something will click that hadn't before. I remember one year it was being able to cook eggs all by herself. Another year it was switching from a kiddie party to a big girl slumber party. Now? Now it's the beginning of parental embarrassment. The beginning of sarcastic sassyness that knows-no-boundaries-but-she-better-damn-well-learn-them. 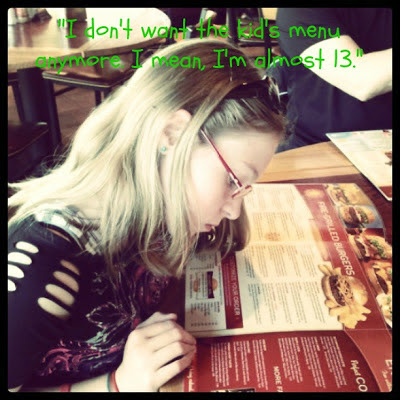 One day last week we went to Red Robin for dinner and my little girl who really doesn't want me to call her Cami anymore refused the kid's menu. A few days later we headed to Payless for some new sandals for summer. Camryn spent the majority of the time we were there trying on fancy high heels we would never let her buy nor wear. Her dad was beside himself, leaning over to me and whispering, "I'm really not OK with this." We sized her foot, discovering she and I are currently the same size. I thought this could be rather convenient because we could share shoes. But my darling daughter wants nothing to do with sharing shoes with her mother. Turns out her feet are skinnier than mine so she can squeeze her little tootsies into shoes I cannot. Whatever. She still has feet way too big for a 12 year old, so there! But her big feet make me think back to when I was pregnant with her and the day I had my 20(ish) week ultrasound. We got a picture of her foot, which the tech commented on being big. When she was born, a friend of ours called her feet skis. There are a couple of things leftover from littlegirlhood. Cami still calls us Mommy and Daddy. Since I know every other kid her age (and younger) is using the shorter Mom and Dad, I find myself asking her when she might make the switch. She seems to be unconcerned with it. Cami still likes to be tucked into bed at night. She is utterly offended by the idea that she could just go up to bed on her own. On the other hand, Camryn is asking me about the possibility of riding her bike places. Like outside of our neighborhood and by herself. I'll take this push and pull right now, even though it might give me a little whiplash. 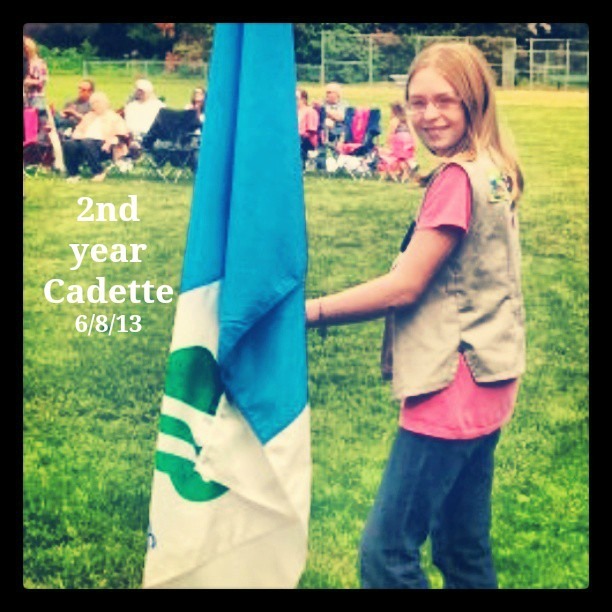 I will keep encouraging her to stick with Girl Scouts for as long as absolutely possible. Because I know it's all going to change. I know my daughter; maybe it will be slowly. But the saying goes, "slowly but.....surely". Also connected with Memories Captured and Pour Your Heart Out.